Cooking shows have covered a lot of ground over the years. Want to learn how to turn your garden pots into tandoori ovens? There's a show for that. 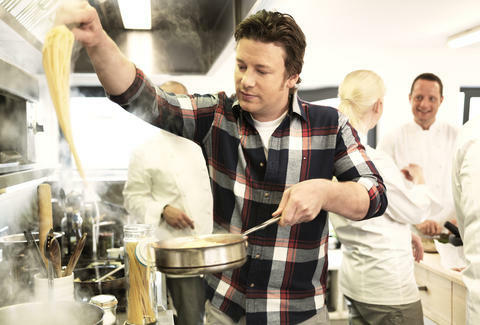 Want to watch sweaty combatants duke it out in a culinary stadium? There are... a lot of shows for that, actually. But for every program that finds success in teaching ordinary folks how to chop onions like a pro (DON'T YOU DARE CRY ON ME! ), there are more than a few that don't quite make the cut. So, to separate the wheat from the chaff, we ranked the best cooking shows of all time. We hope you like Gordon Ramsay, because that guy's everywhere. Can kids today cook just as well as -- if not BETTER THAN -- grown-ups? That’s the question this spinoff culinary competition posits to its viewers, who are invariably reminded that yes, yes they can. And there’s only slightly more crying than in the adult version of the show. Cake Boss didn’t originate the idea of the “pastry-making rock star” (that would be another entry on this list), but it is a frequently entertaining mashup of big attitudes, personal drama, inventive cakes, and unabashed Hoboken promotion. Food Network’s foray into the cooking talk-show format features a multi-headed Hydra of their most popular hosts (Zakarian, Anderson, Mauro, Valladolid, and Lee) that teach you how to entertain in the intimacy of... a studio kitchen! The show sometimes feels a bit rushed, but it’s nice to see the hosts getting along, even if their chemistry was created in a lab by some executive scientists. 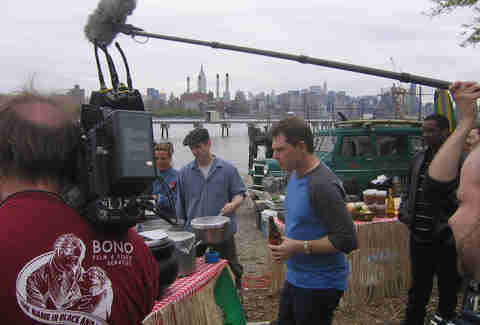 Bobby Flay can cook. That much should come as a surprise to no one. So, too, though, can the unsuspecting down-home chefs that he challenged in this reality show. And while it was occasionally fun to see him struggle to come up with a more New York-influenced recipe for jambalaya, mostly you just wanted to know exactly how the defending cook worked their time-tested magic. While watching Cutthroat Kitchen, you’ll wonder how the show managed to think up the strange and tortuous sabotages it inflicts on its contestants. Then you’ll wonder how the show managed to find contestants who were willing to shell out $10,000 to buy said sabotages. Then you’ll wonder why Alton Brown looks so gleefully mischievous. And then you’ll settle in to watch another episode. With the goal of taking fancy cuisine and adapting it for the masses, Ina Garten has had quite a few successes. Sure, she uses a metric ton of butter and always has fresh floral arrangements adorning her home/set in the Hamptons. But after watching, don’t you kinda want them too? When you think of bombastic personalities in televisual cooking... Guy Fieri is probably the first that comes to mind. But without the influence of the original larger-than-life spice-flinger Emeril Lagasse, many chefs of today wouldn’t even have gotten their start. Watch the guy effortlessly perform culinary stunts in front of an enormous, riveted live audience and you’ll gain a larger-than-life amount of respect for him. BAM! That's the sound of respect. And spices. It’s true that Gordon Ramsay is a vulgar guy. The amount of casually tossed-around bleeps in this nightmarish cooking competition could just as easily have been allotted to an entire season of South Park. But damn, if it isn’t good television, and it probably turned an entire generation of would-be home cooks off of risotto. The aspect of the original Top Chef that really sets it apart is the aspirations of its contestants -- many of them come from smaller cities and want to make it big on a national scale. The entrants in Top Chef Masters are already established professional chefs, which makes this show more of a sandbox for their considerable talents. Not that we’re complaining. 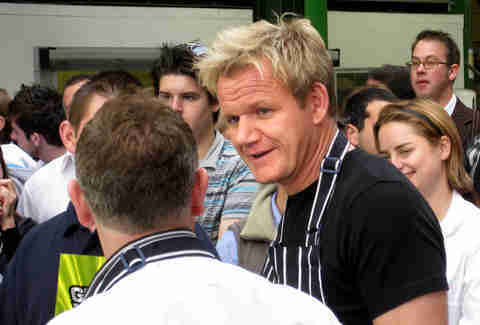 After seeing Gordon Ramsay in Hell’s Kitchen, viewers needed to see where he went next. This cooking competition, judged by our favorite angry Brit along with Graham Elliot and Joe Bastianich in its earliest iterations, successfully combined all the variables of a typical cooking show with intense individual analysis... and -- again -- a whole lot of crying. A huge, dark room. Smoke machines. Two dueling chefs attempting to outdo each other while Alton Brown cries out commentary. 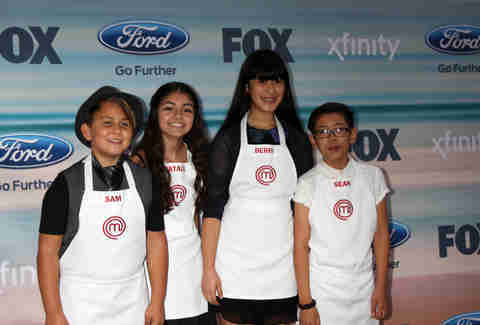 No, it’s not your rich friend Josh’s bar mitzvah -- it’s Iron Chef America. While campier aspects of the original Japanese show took on a more serious tone in Food Network’s version, the number of hilarious sound bites still easily tops any other show on this list. 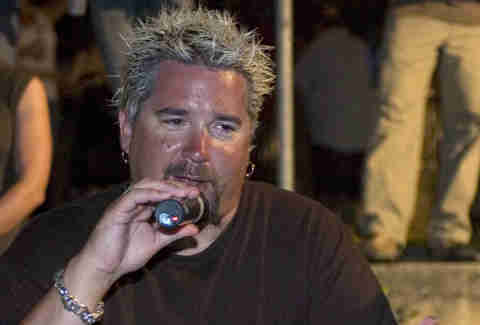 “Who is Guy Fieri?” is a question you rarely hear anymore, mostly because his frosted tips are so bright that they can be seen from a couple states over, but also because his meteoric rise started when Food Network picked him up as a cooking personality with Guy’s Big Bite, his inaugural instructional cooking show. Here, we learned about his affinity for big flavors, and how we could borrow them for our own dishes. Say what you will about the guy, but he opened up home cooking to a whole new audience of dudes. Daytime Emmy Award-winning host Giada de Laurentiis managed to effortlessly fuse Italian and American cuisines in this bright, warm, realistic, and elegantly presented instructional cooking show. Also introduced cooking to a whole new audience of dudes, albeit for a different reason. Also known as "that show your Mom tuned into because she thought Jamie Oliver was cute and wanted to see if the title was for real," The Naked Chef introduced the world to everyone's favorite Cockney rising star for the first time. The show was so-named because Oliver stripped his ingredients down to their barest forms. Not himself. Sorry Mom. Unabashedly enthusiastic and more than a little unorthodox, Clarissa Dickson Wright and Jennifer Paterson (aka “Two Fat Ladies”) created lavish meals from scratch in every episode of their eponymous show, cooking with a ton of lard, and driving around from location to location in an old motorcycle and sidecar. What this show lacked in polish, it made up for in Two Fat Ladies cooking with lard and driving around in an old motorcycle and sidecar. Every episode of Chopped is an all-out brawl. It takes the competitive aspects of Top Chef and condenses them into a show that pulls viewers into a quick, dirty, and ultimately supremely enjoyable viewing experience. The prize might only be $10,000, but because of that, there’s no pretense -- all the chefs are there purely for the joy of putting their skills up against one another. Public television's America’s Test Kitchen might not be as well known to mainstream viewers as the rest of the examples on this list, but its simple format and experimental approach to problem-solving while cooking gets more into the technical side than most other shows would dare. Which shouldn't come as a surprise to pretty much anyone who's ever watched public television. Top Chef revolutionized food on TV when it originally aired, and while subsequent seasons have seen diminishing returns, it will always be the first cooking show that drew us in with personal stories, inventive challenges, and unfamiliar locales, like Survivor for the set who wanted to see people eat something other than bugs. Ming Tsai’s easy-going approach to food -- and early entrance onto the scene in 1998 -- bridged two formerly disparate worlds (cooking and being cool... what did you think we meant? ), and introduced a new generation of aspiring food fans to Asian-influenced ingredients. For American viewers, the hilariously dubbed Iron Chef was a dense, intriguing labyrinth of fast-talking commentators, synthetic smoke, dramatic backstory, and almost perplexing culinary skill. We saw the chef-challengers as dueling titans, even though we didn't really know what was going on half the time, or whether to believe the crazy-sounding history between them. This is the show against which all cooking competitions are judged (probably by an old fortune teller, which is actually who they brought in half the time anyway). Alton Brown doesn't have a background in cooking. But while watching his show, you might think that he's got some experience in... MAD SCIENCE?!?! Strangely not set in a laboratory overlooking a town that misunderstands his genius, Good Eats combined practical technology with a desire for the best food possible. You could count on every episode to include at least a few geeky pop culture references, random bits of history, or bit-part actors pretending to be a butcher, baker, or... an ancient Greek philosopher. In a grocery store. Giving a lecture about grapes. There is no single figure more responsible for making Americans feel like they can actually cook than Julia Child (she was also responsible for keeping them safe -- during her tenure AS A SPY). Her first-ever show, The French Chef, was the program responsible for introducing French cuisine to the home-cooking populace, who had previously associated it solely with escargot and silly hats. 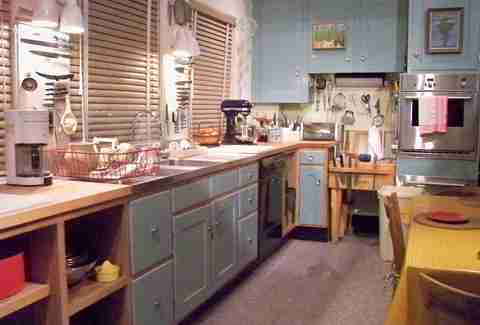 There is no other show that can claim to have had as much of an influence as this one, as it took an activity that most Americans had long ago abandoned for being “too difficult” -- COOKING GOOD FOOD -- and made it into something that was actually fun. Adam Lapetina is the partnerships editor at Thrillist, and has probably spent waaaay too many late nights watching Iron Chef. Read his musings at @adamlapetina.